Our range of products include permanent lifting magnet, circular lifting magnet, rectangular lifting magnets, coil lifting magnets, automatic lifting magnet and crane magnet. Circular Lifting Magnet from Star Trace is of robust construction and handles Iron slabs, Steel Ingots, Bloom Billets, Light finished parts, scrap, pig iron etc. 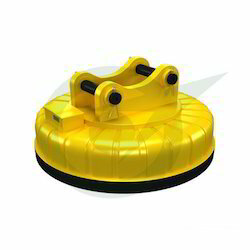 The Circular Lifting Magnet is the most trusted equipment in rigorous working conditions were not even a small slip in the working is affordable. The outer covering or shell of the Circular Lifting Magnet is made of pervious steel casting which adheres to IS: 4491(BSS-1617) which is an indicator for being properly machined. The brink of the Circular Lifting Magnet is closely ribbed to give additional strength during lifting operations. In the Circular Lifting Magnet the outer and central poles are made from magnet steel which has high permeability. The core has recess arrangement to protect the tensile bolts. The face of large Circular Lifting Magnet is encircled for greater strength during operation. 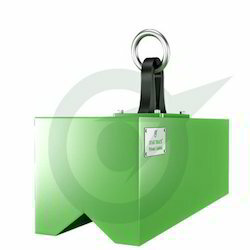 The Circular Lifting Magnet has a terminal box which is designed to give protection while it is in operation. The arrangement of the cables in the Circular Lifting Magnet is in such a way that they do not bring in moisture to the windings as they have to be well protected for effective functioning. STAR TRACE Load Lifting Magnets or Rectangular Lifting Magnet are of robust cast and bolted or fabricated construction designed for handling Solid Slabs, Steel Ingots, Bloom Billets, Pig Iron, Light finished parts, Scrap and gives Maximum reliable, efficient and economical performance in the most arduous service condition. Rectangular Magnets Or Rectangular Lifting Magnet for handling Steel plates, Bars, Billets, Sections and Tubes can be designed and manufactured to meet customer’s requirement. 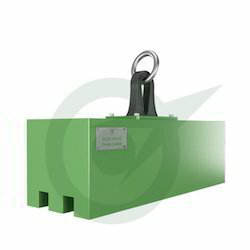 The construction of these Rectangular Lifting Magnet is similar to above with cast steel shell and poles fabricated from low carbon steel.Very long loads can be handled with two or more magnets spaced on a spreader beam to maintain equilibrium and ensure adequate supply factor. mm kW V kgs A/300 Kgs B/100 Kgs chain Kgs. As a foremost company of this domain, we are manufacturing, exporting supplying an extensive gamut of Circular Lifting Magnet. The offered lifting magnet is designed and manufactured by our professionals as per the set market norms by utilizing best quality raw material and latest technology. This lifting magnet is provider in different stipulations, this can also be customized as per the needs of the customers. 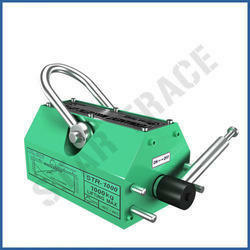 STAR TRACE Electromagnets On/Off capability and be controlled in automated sheet metal handling system. Provide concentrated holding power and high responsiveness in manual or automatic applications. Ideal for lifting or pick and place application where parts have uneven surfaces or odd shapes.They can be custom machined to specifically fit the applications. Ideal for the handling of thick ferrous items such as steel plate,forgings,die castings and other non-flexing items. Magnetizing Coils for magnet size up to 900 mm dia is pure annealed wire wound and above these are strip wound. The glass insulation of class H standard with Fibreglass NOMEX tape forming an interlayer makes coil withstand high temperature. Bumping Plates are of high grade Manganese Steel Casting as per IS - 276 with heavy ribs for added strength. These are clamped in position by the center and outer poles offering complete protection to the coil. The magnets are suspended with three legged STRING CHAINS made of best quality forged steel terminating in a forged ring. A two core cable is provided for connection with the supply and suitable insulated plug and socket ensure easy operation. Automatic Lifting Magnet is made of strong magnetic material adopting ratchet wheel and pallet mechanism together with the raise of travelling crane to control the mandrill and automatically absorb and unload the materials, featuring no electricity consumption, convenient and safe in operation. It is widely used for lifting and transporting short and thick plates in the factory, dock, warehouse and transportation department. The air gas adjusting rod is equipped in particular which can adjust the magnetic force conveniently. The quick, safe and easy way to lift ferrous materials and work pieces. These are two Pole Permanent Magnetic Lifters. The two poles are at the bottom of the lifter. These lifters use high grade Magnets for producing strong magnetic flux path through the two poles. The lifter is placed on the MS flat/block that is to be lifted. The turn of the handle in its ON position with MS flat/block/cylinders (to be lifted) at the bottom ensures completion of magnetic flux path through the MS body. The MS body gets attached to the lifter. The turn of the handle in its OFF position detaches the MS body from the magnetic lifter. Permanent lifter is made up of two parts, such as permanent sucker and discharge device. The permanent sucker is made up of permanent magnet and magnet-conductive plate. The magnetic force wire generated by the permanent magnet will go through the magnet-conductive plate, attracted materials and form a closed circuit thus to achieve the purpose of lifting the steel materials. It is suitable for being used to lift and transport magnet-conductive billets, plates and rounds in industries of mechanical engineering, metallurgy, shipyard, car factory, dock and etc. The Automatic permanent magnetic lifters are mainly used for lifting the steel plate and round steel, because of the light weight, ease of operation and powerful suction, magnetic lifters are widely applied in ship engineering, warehouse, transportation and machinery manufacturing. Suitable for Flat and round material. Very High Lift to its weight ratio. Quick Easy Operation with ON/OFF System. Improves Plant Safety No direct contact with men. Large and Heavy work piece can be moved/handled safely easily by only one operator. Commonly used near flame cutting. Can handle finished components without leaving behind any scratch marks, unlike binding and slinging. Can be used with spreader beam hanging multiple magnets for long plates/pipes /bars. Can be used with mobile cranes. Star Trace being an expert manufacturer, supplier and exporter of magnetic equipment has introduced the 'Crane Magnet' as an addition to lifting equipment which out performs all its peers in efficiency and quality. The crane magnets are basically electromagnets used alongside cranes so as to complete the lifting action needed in factories, dumping grounds etc. Crane magnets bear a lot of responsibility in terms of service, safety and time. The sales of crane magnet have diversified into several applications due to their efficiency. 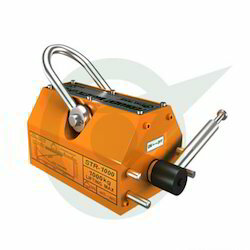 As Crane magnets are electro magnets, reasonable supply of electricity is required for the operation. Switching between loading and unloading with simple operation they are the most convenient in handling huge volumes of ferrous loads irrespective of shape and size. The crane magnet puts to use the electro-magnetic induction principle, the core of the electro magnet is wound by coils which are the ones that conduct electricity. The size of the core and the number of turns of the wire through which current passes determines the lifting capacity. 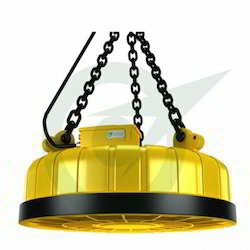 An increase in both the components will directly increase lifting capacity of the crane magnet. Electromagnets are stronger when compared to natural magnets as far as the crane magnets are concerned as they are employed in huge work areas handling heavy materials. The finish and the size of the crane magnet is related to its strength and is chosen accordingly to suite the working environment. 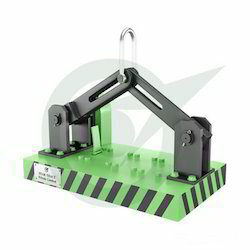 Crane Magnets are operated by turning off and turning on the electricity supply which provides hazel free work flow. With respect to their capacity to handle heavy materials their application is found in handling finished steel sheets, iron rods, moving bulk scrap in dumping yards etc. Varying strengths of crane magnet can be applied to suite the exact requirement in lifting. Drop in a sales inquiry to experience unmatched quality in our machines and after sales services rendered by us. You could also drop in to our Head office at Chennai, Tamilnadu, India. Star Trace a notable manufacturer well known for introducing innovative equipment catering to the requirements of clients has yet another addition which is the "Excavator Magnet". The Excavator Magnet is used in open yards to handle large irregular steel slabs, sheets and scraps that are dumped in places where they cannot be moved using the overhead cranes. The Excavator Magnet makes use of a powerful electro magnet that handles considerable volume of metal objects to evacuate a place. The Excavator Magnet is a complex construction presented in the most easily operatable manner so as to carry out work at a fast pace. The crane operator is given maximum reach with the magnet where in he will be able to reach out to places narrow and crooked to recover steel objects. The flexibility of tilting the magnet on all sides and reaching out with the arm of the crane proves worth while of its ability as clearing takes place in bulk. 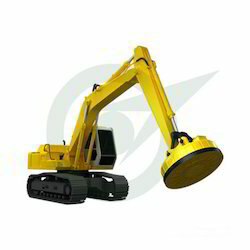 Owing to it size the Excavator Magnet is also capable of crushing the picked up material by applying pressure. Clearing of yards, dumped with scrap can be done consuming less time when compared to other clearing methods. Loading heavy materials into trucks from open space is a common activity done by the Excavator Magnet. As the fixture of magnet allows maneuvering lifting of small sized steel objects was never an issue and was carries out with least effort. Designed by an experienced manufacturer, supplier and exporter in Chennai (Tamilnadu, India) the Excavator Magnet has been used by clients globally. Sales of Excavator Magnet have reached many industries who are delighted with its trouble free operation. Indulge in a sale with us and experience excellence at work. Looking for Lifting Magnets ?